When your tattoo is brand new, it is essentially an open wound and will be extremely sensitive to anything that comes into contact with it. Therefore you need to be extremely careful when choosing what to apply to it when cleaning the area. Many soaps available in shops and supermarkets contain very harsh ingredients that can really irritate a new tattoo if rubbed onto the area. Some ingredients can delay the healing process of your tattoo and cause unwanted side-effects and reactions such as itching, redness, rashing and dryness. Probably the best tattoo soap that I’ve tried on any of my new ink. This soap can be used on tattoos and also on dermal piercings. This tattoo soap can also continue to be used after the healing process of your tattoo is complete should you really like using it. 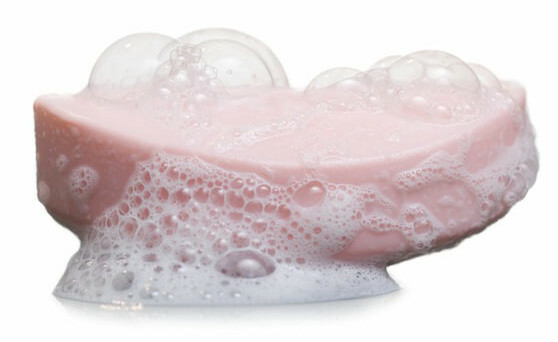 This specific soap has been designed to provide a broad-spectrum germicidal solution, which in layman's terms means that the soap has been formulated to kill as many types of bacteria as possible. Even though the soap is great at killing germs, it's still incredibly gentle on the skin, which is so important when using it on a new tattoo where the skin is going to be extremely sensitive. The soap has recently been re-formulated to help remove more dead skin cells and dirt than before, so it’s in no doubt even better than when I last used it. 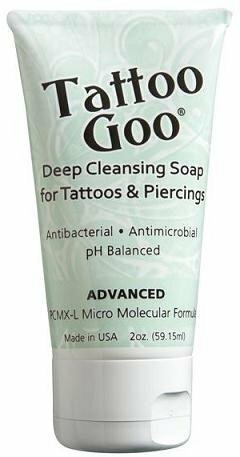 As dry skin is more prone to harbouring various types of bacteria, Tattoo Goo Tattoo Soap has been created to ensure that no high PH ingredients such as ammonia have been added to the product to ensure that the soap never excessively dries your skin out. This tattoo soap is my pick of the bunch due to its gentle formulation and its ability to still kill a vary wide variation of harmful germs and bacteria that are so dangerous to a new tattoo. Another good quality antibacterial tattoo soap which serves its purpose very well. The soap’s protection qualities are designed to ensure that your tattoo heals vibrantly, so you’re left with a bright and sharp tattoo after the initial aftercare period has finished. The soap is enriched with natural soothing ingredients such as aloe vera to ensure that it’s extremely gentle on sensitive skin. Excess drying and scabbing can be prevented using this soap as it’s much more moisturizing than other harsher antibacterial products. As mentioned, the tattoo soap is packed with mostly natural ingredients and is paraben free and vegan friendly - so you can be assured that your skin is being cared for properly by using this product. High in natural, skin-friendly ingredients along with being vegan-friendly, H2Ocean Tattoo Foam Soap has all the qualities required to properly clean your new tattoo and ensure that it heals as best as possible while at the same time making sure your tattoo remains moisturized and hydrated to help prevent any adverse skin reactions from appearing. Benzalkonium Chloride, Purified Water, Poloamer 188, Aloe barbadensis Leaf Juice, Disodium EDTA, Salt. Another quality, specially designed tattoo soap - and definitely one of the best specialized soaps around - definitely up there with the Tattoo Goo product above. Although not a tattoo-specific product, this cleanser makes the list for being extremely skin-friendly and is the perfect choice for anybody who suffers from any type of ultra-sensitive skin condition, or just for anyone who want to be as gentle on their new ink as possible. The soap has been recommended by the dermatologist association and has been formulated without any additional artificial colorings or fragrances. The beauty of using this product is not only the fact that it can be used on all skin types and all areas of your body, but also the fact that you can use it as a general-purpose body soap too, meaning that you don’t just have to use it on your new tattoo, and can continue using it for a long as you like after your tattoo has healed. The perfect general-purpose body cleaning product that is more than good enough to ensure that your tattoo remains clean and free of any harmful germs. The soap is extra useful as it can be used for as long as you like once your tattoo has healed. Apply a moisturizing lotion to the area to prevent it from drying out and causing skin cracking and irritation. We review our favourite tattoo lotions here. Wash your tattoo 2-3 times a day for about 2-3 weeks, or until the tattoo has completely finished scabbing and peeling. Check out this article if you would like to see a more in-depth guide to properly cleaning your new tattoo. When searching for a good quality antibacterial tattoo soap for your new ink, you need to be looking for something as organic as possible. Many artificial ingredients are actually the main reason why lots of soaps sold in shops are too harsh for your tattoo. You'll want to look for a tattoo soap that contains no artificial fragrances as lots of these additives are known to cause irritation for many new tattoo owners. Remember though that everybody is different and reactions will vary from person to person (some people’s tattoos will not react to various additives at all). Artificial coloring can be another reason for skin irritation caused by soap - although again, it depends on the specific ingredient added, and also on the person. Finally - avoid any soaps that contain alcohol. Alcohol will be very harsh on your new tattoo and will most-definitely cause it to dry out too much, potentially leading to itchiness, dry/cracked skin, rashing and delayed healing.